dailydelicious: Yummy Blog Award, Oh mine! The Hungry hamster has nominated me for Yummy Blog Award, I’m so surprised and it’s a great honor for me. The Yummy Blog Award is an award given to blogs with recipes/photos. I really love to bake, cook (and yes buy a cookbook), so this is the place that I will find my new friends who love to be in the kitchen or in front of the oven as much as me. I have to say that I really love many kinds of desserts and choose only two can be a hard thing for me. So I tell you the couple of the desserts which I have a good memory about them and they can be called my favorite too. 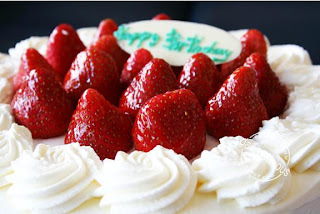 First: My Birthday Cake, it’s a Japanese Sponge Cake with fresh cream strawberries (just like the one that Hungry Hamster likes) I get it almost every years (for 5 years now) from my dear. I love the softness of the cake and when pairing with the sweet whipped cream, it’s heaven sent. 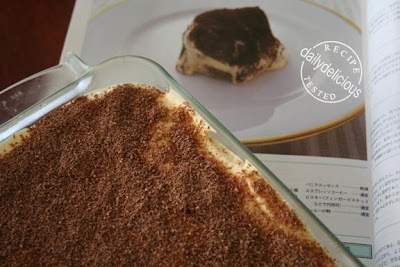 Second: Tiramisu, how can I say more? I love it from the day that I tasted it and I really want to make it by myself. I love the one from Harrods and any time that I go to London, this is must have on my list. I don’t know why but I can smile every time that I have the Tiramisu, may be I’m a little crazy (or drunk) when I take it. First: Dhanggits kitchen, French food can be easy to make (plus great pictures). Second: Dessert by candy, I read her blog for so long and I like her pictures and idea. thanks for giving me this award :-) and i congratulate you too for receiving one!! your blog looks delicious! !